Definition at line 284 of file btrfs.h. Definition at line 288 of file btrfs.h. Referenced by assign_addresses(), look_for_roots(), update_backup_superblock(), and write_metadata_items(). Definition at line 289 of file btrfs.h. Definition at line 290 of file btrfs.h. Definition at line 305 of file btrfs.h. Definition at line 301 of file btrfs.h. Definition at line 295 of file btrfs.h. Definition at line 294 of file btrfs.h. Definition at line 292 of file btrfs.h. Definition at line 286 of file btrfs.h. 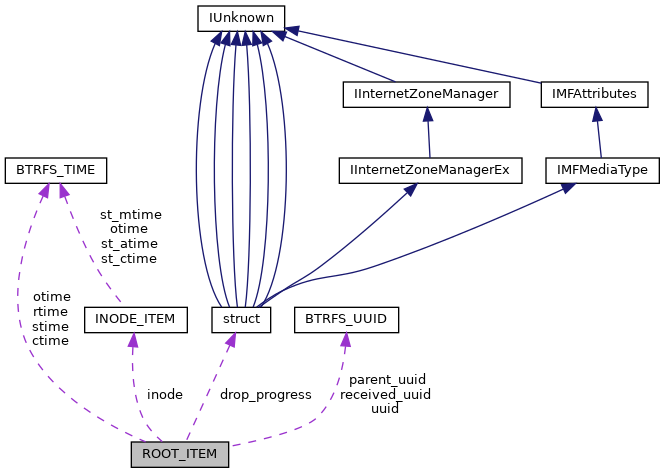 Referenced by assign_addresses(), look_for_roots(), and update_backup_superblock(). Definition at line 297 of file btrfs.h. Definition at line 285 of file btrfs.h. Definition at line 291 of file btrfs.h. Definition at line 293 of file btrfs.h. Definition at line 287 of file btrfs.h. Definition at line 306 of file btrfs.h. Definition at line 302 of file btrfs.h. Definition at line 299 of file btrfs.h. Definition at line 300 of file btrfs.h. Definition at line 309 of file btrfs.h. Definition at line 296 of file btrfs.h. Definition at line 308 of file btrfs.h. Definition at line 304 of file btrfs.h. Definition at line 307 of file btrfs.h. Definition at line 303 of file btrfs.h. Definition at line 298 of file btrfs.h.